Green Patrol, a Russian ecological organization with shady government ties, and whose findings are routinely denounced as political fabrications by Russian environmental scientists, has accused Norway of polluting the Murmansk region, and not the other way around. The announcements by Green Patrol at a Murmansk press conference Thursday burrowed into the long-standing conflict between Norway and Russia over cross-border industrial emissions from the Kola Mining and Metallurgy Company (KMMC), a daughter company of the giant Norilsk Nikel located some four kilometers from the Russian-Norwegian border. The group’s assertions also strongly contradict scientific evidence made available by both Russian and Norwegian sources, both of which continue to show that the KMMC’s emissions consistently exceed the acceptable pollutions rates set by both countries. Insisting that its evidence was corroborated by the St. Petersburg based Atmosfera research institute, Green Patrol told the Murmansk briefing that half the pollution in the Murmansk area comes northwest Russia’s nearest European neighbors. Specifically, Green Patrol said that Norway pollutes Russia with 2.4 times more nitrogen compounds than flow in the opposite direction. The group also said Finland was responsible for more than 2.8 times the amount of nitrogen compound pollution than Russia was responsible for in Finland. Dobrokhotov said that 45 percent accounted for 393 tons of nitric oxide per year. At the same time, Green Patrol said that the amount of nitrogen compounds coming to the Murmansk Region from foreign sources was below accepted pollution norms. 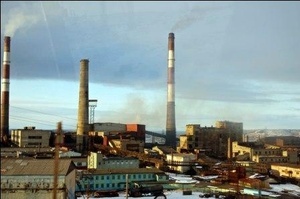 Dobrokhotov all the same issued an appeal to Norway, asking it to cooperate in joint inspections of Norwegian industrial sites to determine the sources of Murmansk’s pollution. Neither Green Patrol nor Atmosfera provided any written documentation to their findings, nor any information on how they had reached them, other than to say that the typically secretive KMMC had thrown its doors open for inspections by the group. A 500-page report on their pollution finding expedition, which stretched across the north of Russia between July 5 and August 5, is supposedly forthcoming. Larisa Bronder, a Bellona advisor who specializes in pollution issues surround the KMMC intends to send an official request for Green Patrol’s data. “It is important to see their results in black and white before we can issue any detailed comment on them,” she said. Oleg Mitvol, former deputy head of the Russian Federal Service for the Oversight of Natural Resources (Rosprirodnadzor) immediately dismissed Green Patrol’s findings as specious in a telephone interview with Bellona, pointing specifically to it’s head, Andrei Nagibin’s political ties. Independent biographies of Nagibin show he was a former Duma Deputy of the Fair Russia party from the Far East Sakhalin region, who also has many business ties to environmentally questionable businesses such as forestry. His group has also spoken out on behalf of supporting the building of Liquefied Natural Gas (LNG) terminals near Vladivostok by state gas monopoly Gazprom. Instead, Mitvol, Bellona’s own investigations into Green Patrol and a source formerly with Rosprirodnadzor, all confirm that the organization’s agenda is political, and that the supposed NGO is entirely financed by the Russian state. Further irregularities in Green Patrol’s registration status as an NGO point to the suspicion that the groups mandate is to act as a hired gun to paper over areas of ecological contention. Further research by Bellona on the Russian site of the Justice Ministry (in Russian) – the primary site where this information is mean to be publicized – revealed no information about Green Patrol at all. A search of Green Patrol’s website (in Russian) also shows an irregular listing of its address, suggesting to Nikolai Rybakov, ERC Bellona’s executive director, that the organization is a government operated NGO. The KMMC occupies three towns on the Kola Peninsula: Zapolyarny, where the KMMC mines its nickel ore, Nikel where it is smelted, and Monchegorsk, where the nickel is refined. It has lately become routine that pollution findings on the KMMC published by Rosprirodnadzor, and those established by Russian Hydrometeorology and Environmental Monitoring Agency (RosGidromet), which works closely with the Norwegian Institute for Air Research (NILU) are at odds. Figures compiled by NILU for 2012, the most recent year for which figures are available, indicate that emissions of sulfur dioxide from the KMMC’s smelting facilities in Nikel total 100,000 tons a year and that this figure is 5 times greater than the total emission of sulfur dioxide from all possible sources in Norway. In response to an official inquiry from Bellona regarding the 2012 figures, the KMMC itself confirmed in a letter dated July 7 that its facility in Zapolyarny had emitted 39,083 tons of sulfur dioxide; its Monchegorsk facility, 33,325 tons and its Nikel facility, 63,592 tons. Bellona adviser Bronder said these NILU and KMMC figures are in agreement. They were also confirmed by a 2012 report from the Murmansk Region’s Committee for Industrial Development, the Environment and Natural Resource Usage, which compiled its data using dozens of sources, including Rosprirodnadzor, The Russian Ministry of Emergency Service, Bellona and RosGidromet. Another series of discrepancies in measurements between Rosprirodnadzor and RosGidromet were brought to light as recently as last month. Murmansk regional prosecutors and Rosprirodnadzor, in response to allegations of over-pollution by a northern Norwegian Mayor, Cecilie Hansen, in Sør-Varanger, insisted that at no point did the KMMC exceed accepted pollution levels during the summer. Data from RosGidromet, however, showed sulfur dioxide pollution levels had been surpassed during every period singled out my Rosprirodnadzor by at least an average factor of 2 per each day studied. The study represented a departure from Rosprirodnadzor, which usually monitors air quality on a random basis. For the July study, it instead chose to analyze a like RosGidromet. But Dr Berglen also said he was “a bit worried” by the apparent connections to politics that the Green Patrol announcements suggest. Dr. Berglen discussed the allegations made by Green Patrol with the Norwegian Minister of the Environment on Monday. He said the ministry intends to follow up on the allegations.